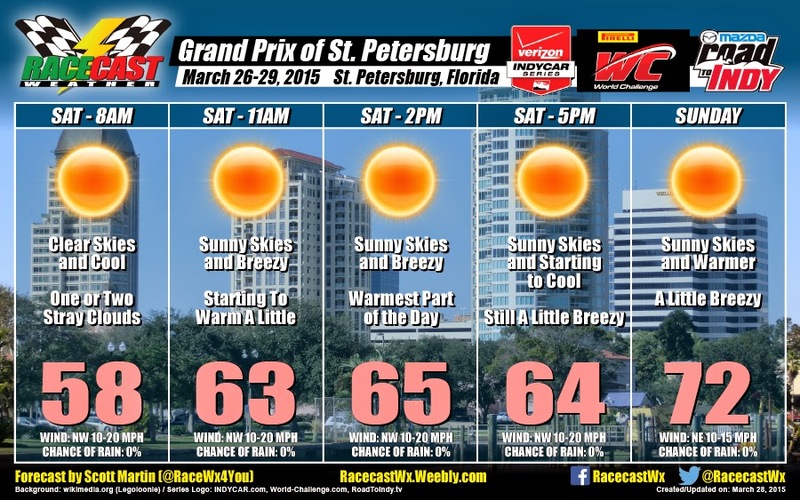 The 2015 IndyCar season gets rolling in St. Petersburg for the fifth year in a row on Sunday. Will Power won the event last year to jump start his championship-winning campaign and will be looking for more of the same this time around. Aero kits will make their first race appearance at St. Pete on Sunday. From the early practice sessions and pre-season testing, it looks as if Chevy have the early advantage when it comes to speed. Through session one, the top five spots in terms of lap time were all occupied by Chevy. Team Penske was the largest team contributing to that number. Will Power, Juan Pablo Montoya, and Helio Castroneves claimed the top three spots. Times were also looking impressive early on Friday. Power’s fastest lap speed was 105.415 mph. That’s faster than every year’s pole-speed at St. Pete except 2012 and 2013. Times like this are a good sign early on in the season and development process of aero kits. Expect the top runners to beat the previous years’ pole speed on Saturday. Penske has traditionally had good success at St. Pete, and there’s no signs of that changing just yet. Of the ten races run at the circuit since 2005, a Penske driver has won the race five times. Castroneves leads the charge with three race wins, his most recent was in 2012. There should be a fair number of challenges for the lead on Sunday (if history is anything to go by). The past three races have seen a combined 20 lead changes. However, it’s important to note that none of the races mentioned were run with cars using aero kits. The Chevy v. Honda battle will play a large role in how the competition pans out throughout race weekend. Keep an eye out for qualifying on Saturday to see where the manufacturers truly stack up after testing and practice sessions for St. Pete. But even if your favorite driver doesn’t get pole position, don’t be too discouraged. Only two drivers have won the race from pole since 2005; Graham Rahal and Dan Wheldon both won the race after starting from P9. Sunday’s forecast is high 60’s to 70’s and “a little breezy.” Perfect racing weather. Race weekend forecasts, provided by RaceCast Weather, will be featured in each of Single Seater’s race notes throughout the season. For more information about the forecasting process, you can view our interview with Doug Schneider of RaceCast Weather here. Rumors have been brewing about a possible IndyCar race in Boston. If it materialized, it would be one of the few races on the east coast and would serve as a nice replacement for Baltimore which ran 2011-2013. Do you like the idea of a Boston race? Would you attend it? Let us know in the comments below. Single Seater will be trying something new for the race. In addition to our race notes, we will host a live blog for the race itself. This won’t be your average, generic live blog, though. At Single Seater, we are devoted to data journalism and statistics, and that’s exactly what our live blog will be like. Instead of just highlighting what’s going on in the race, our live blog will talk about statistics, race strategy, and other interesting topics surrounding the race. It’ll be fun. Join us here on Sunday at 3 p.m. ET when the race starts as we talk about the numbers, data, and stats behind the 2015 IndyCar season opener. How Much Does Starting Position Matter?